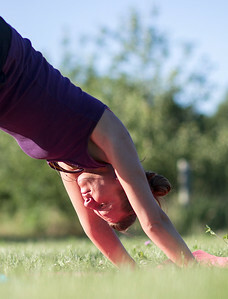 Sarah Nader - snader@shawmedia.com A yoga class is held outdoors at All Seasons Apple Orchard in Woodstock in celebration of International Day of Yoga Tuesday, June 21, 2016. The class went through a short meditation session followed by a vinyasa flow class. 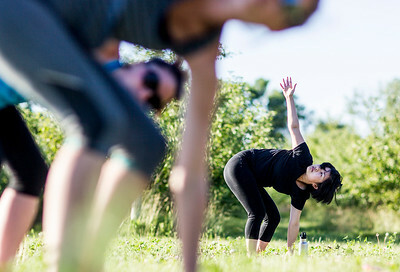 Sarah Nader - snader@shawmedia.com Ester Kim of Woodstock takes a yoga class held outdoors at All Seasons Apple Orchard in Woodstock in celebration of International Day of Yoga Tuesday, June 21, 2016. The class went through a short meditation session followed by a vinyasa flow class. Sarah Nader - snader@shawmedia.com Jessica Schmuhl of Wonder Lake takes a yoga class held outdoors at All Seasons Apple Orchard in Woodstock in celebration of International Day of Yoga Tuesday, June 21, 2016. The class went through a short meditation session followed by a vinyasa flow class. Sarah Nader - snader@shawmedia.com Erin Ording (left) of Wonder Lake takes a yoga class held outdoors at All Seasons Apple Orchard in Woodstock in celebration of International Day of Yoga Tuesday, June 21, 2016. The class went through a short meditation session followed by a vinyasa flow class. Sarah Nader - snader@shawmedia.com Yoga instructor Lisa Young teaches a yoga class held outdoors at All Seasons Apple Orchard in Woodstock in celebration of International Day of Yoga Tuesday, June 21, 2016. The class went through a short meditation session followed by a vinyasa flow class. Sarah Nader - snader@shawmedia.com Erica King of Woodstock takes a yoga class held outdoors at All Seasons Apple Orchard in Woodstock in celebration of International Day of Yoga Tuesday, June 21, 2016. The class went through a short meditation session followed by a vinyasa flow class. 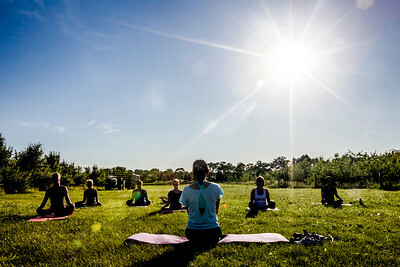 Erin Ording (left) of Wonder Lake takes a yoga class held outdoors at All Seasons Apple Orchard in Woodstock in celebration of International Day of Yoga Tuesday, June 21, 2016. The class went through a short meditation session followed by a vinyasa flow class.